I have spent the last week digging into some heavy duty wedding planning while my daughter was home visiting from New York. One of the topics of discussion was centerpieces, which I think we pretty much have nailed down for the wedding, but now I have centerpiece crafts on my mind. 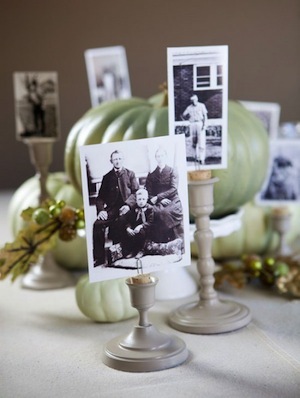 There are just so many ideas for creating unique centerpieces for entertaining or to have for everyday use. When you need to make centerpieces for several tables, it’s nice to have some ideas that are affordable. 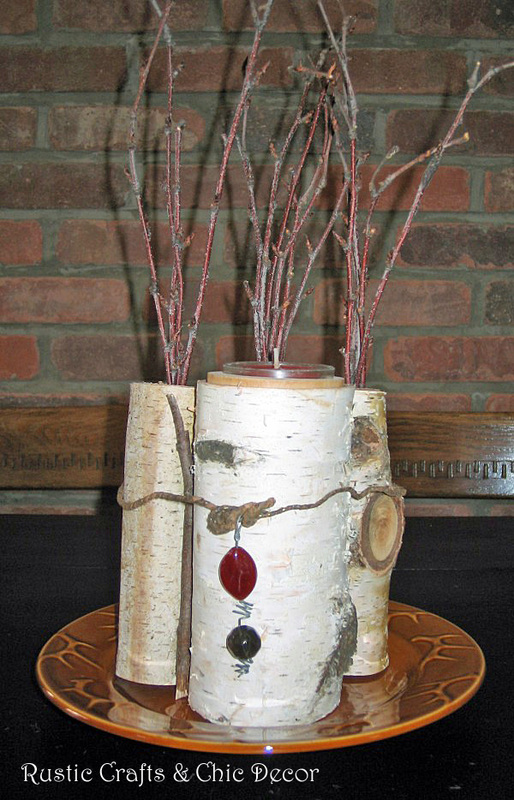 I made a simple centerpiece using birch logs for our cabin that would be an easy and inexpensive one to use for entertaining. It’s just a matter of drilling holes into the top of a few birch logs to insert birch branches and making a larger opening in one of the logs to hold a tea light candle. Another version, that I have done, is to insert cattails into one large birch log. Here are some more centerpiece crafts that are unique, easy and affordable. 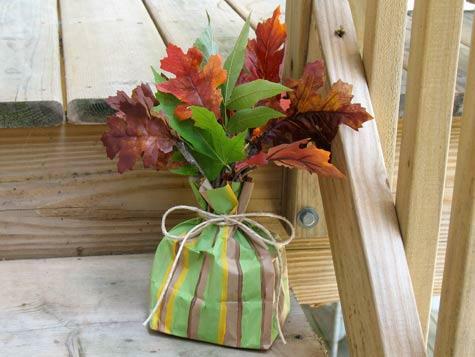 I love this simple idea using paper bags, paint, twine, twigs and natural or silk leaves. It’s especially perfect for a Fall occasion. You could also paint the bag in Spring colors and fill the bag with real or silk flowers for a different look. Vintage bottles are one of my favorite things to use in centerpiece designs. 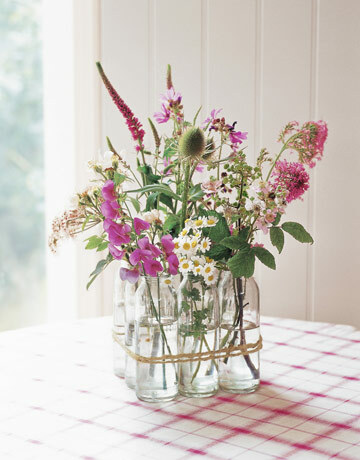 I especially like this idea for using nine uniform vintage milk bottles, that are wrapped in twine, to hold fresh flowers. Along the same lines as vintage bottles are apothecary jars. You can fill them with anything to suit your needs. 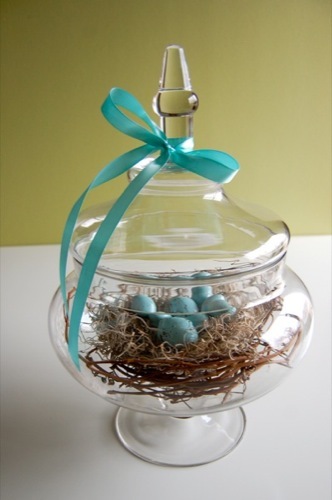 This example with the nest and blue eggs is perfect for Easter or any other Spring occasion. The addition of colored ribbon helps to accentuate the desired color scheme as well as create some more interest. Make sure to check out this thrifty centerpiece tutorial. 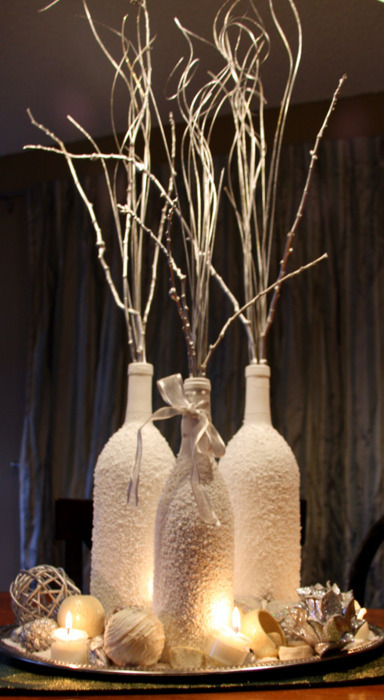 You can also use wine bottles to make some very elegant looking centerpieces. Adding paint and Epsom salts creates a nice texture which highlights some shimmering branches perfectly. Finally, using a planter box as a base for a centerpiece is a fun and unique idea. 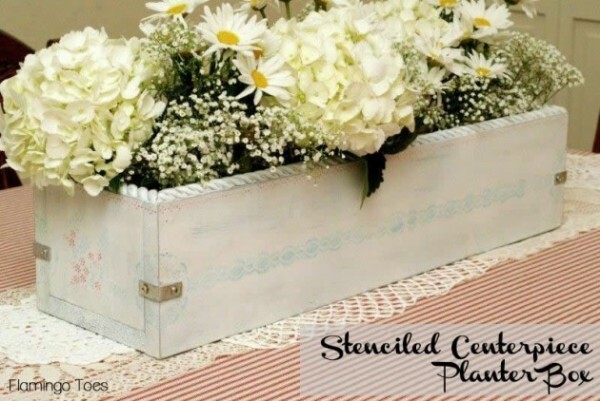 This example is actually a handmade, stenciled planter box but you could also use an existing box and decorate it with paint and/or stencils for an original design. Do you have any ideas for centerpiece crafts? Feel free to share them in the comments!